← WHAT WAS I THINKING! This month, more likely than not, you will find me here at my computer putting every spare minute into completing the daunting task of writing a 50,000 page novel before the end of November. I am now at Day 6 and my “Tools” tab tells me that the word count is currently at 7327. If I calculate correctly, that leaves me shy of 445 words, going by the goal of 1666 a day. Whew! In the midst of this consternation, I became distracted by the scent of something rich and earthy wafting up from the kitchen downstairs. It persisted and distracted so there was nothing to be done at one point, but to follow my nose. “What’s that?” I cried out, at first only seeing the mess about all counter tops and stove, not to mention some orange debris on the floor. 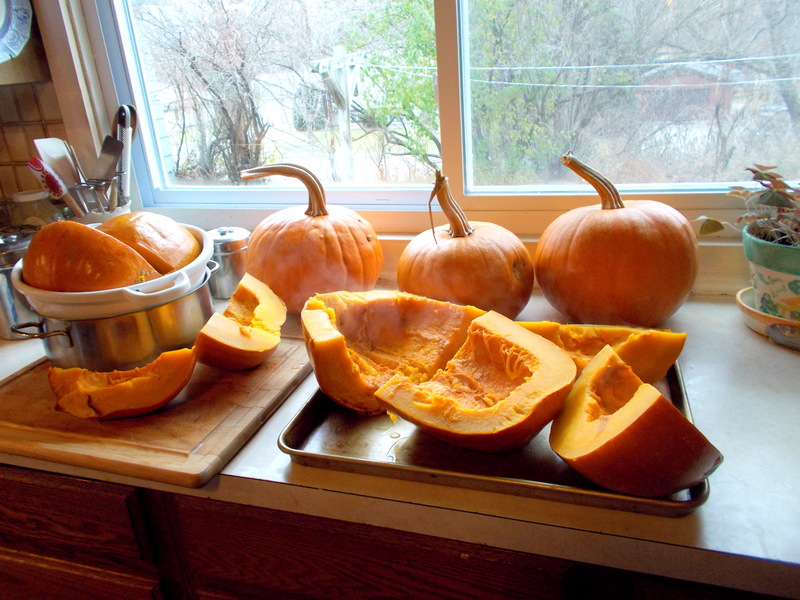 “It’s the pumpkins,” he replied, as if that was normal, if not obvious. T.M. always said that our place on Mt. Faith, when the leaves are down and it is surrounded by bare stalks and branches, looks like the spooky old house on the hill. We were gone last Halloween and so we had no experience in what to expect. 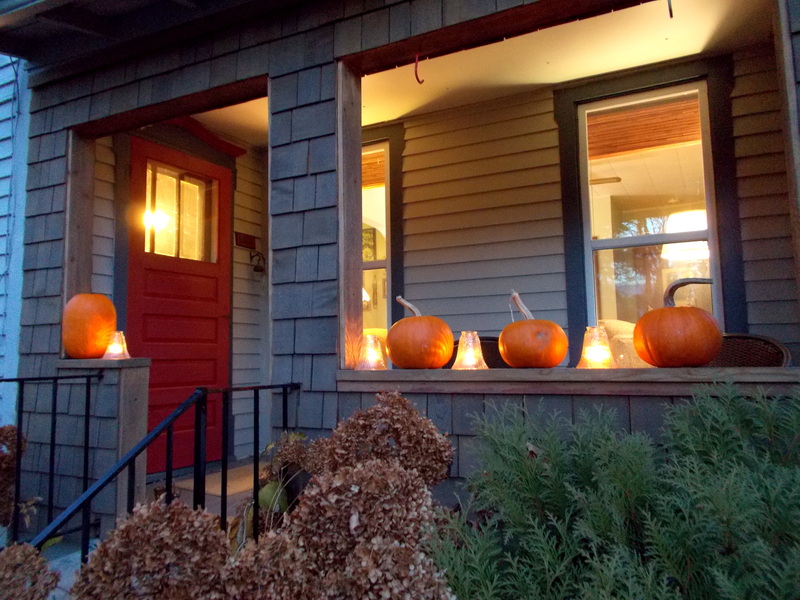 But I put the pumpkins around the front porch and interspersed them with votives to make it seem welcoming and cheery. We bought a giant bag of chocolate covered mint patties (my mother always said to buy something that you would later want to eat) and because that didn’t seem like it might be enough, bought another. On the big night we waited and worried about not being able to hear a knock at the door. And waited. And finally were visited by a teensy trick-or-treater who proclaimed that she was Superman-woman. We waited some more and called it a night. The two bags of mints have been relegated to a shelf in the basement, so as not to be too tempting. This morning my husband decided that, even if the chocolate covered mints went to waste, the pumpkins should not. And so he is currently baking the flesh in order for me to make pies. Don’t get me wrong. I like to make pies. I even consider pastry one of my specialties and take pride in knowing one of the little secrets for not adding too much liquid to the amount of flour. Anyone who has made a pie knows that you need to make the dough pliable enough to roll out and work without falling apart. But if you add too much water the pasty will be tough and not flaky. The secret – use half vodka and half water and the alcohol will evaporate in the baking but remain in play long enough to work the dough. But honestly – bake pies now? With 445 words at large and 1666 to get a jump on in case I’m too depressed after the election? But I have to admit, it’s rather dear that he decided to bake pumpkin and he clinched the deal by carefully separating the seeds and roasting them separately with sea salt. I guess I better take a break. And I need to clean the kitchen. This entry was posted in COMMUNITY, favorite things, food, minnesota life, writing. Bookmark the permalink. Where do I send a check for one of the first copies of a book I know I am going to love because I love the author and how she expresses herself?